■ On 2 October 2010, the Public Prosecutor announced the referral of a citizen from Aker village to the Psychiatric Hospital to check his mental condition. The person had been arrested in circumstances related to security issues. ■ On 3 October 2010, the High Criminal Court found three defendants guilty of attempting to set fire to al Diraz Primary School for Boys, and sentenced each to three years´ imprisonment. The school was attacked by burning bombs on 8 May 2010. In the same date, the same Court ordered to carry out medical examination on two defendants involved in the ‘Scrap fire’, after claiming they were forced to do so. 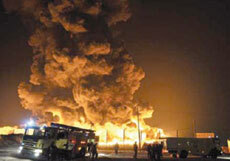 The fire took place in Askar, on 19 August 2010, and lasted for four days destroying properties and polluted both the environment and nearby residential areas. In another hearing session held on 10 October 2010, the medical report revealed injuries to the bodies of the accused but was unable to identify the time, reason, or device used in inflicting the injuries. ■ On 3 October 2010, the Lower Criminal Court sentenced three individuals to a year’s imprisonment for rioting and setting fires. ■ On 6 October 2010, the General Prosecutor referred five defendants (one is currently on the run) to the High Criminal Court. The five individuals have been accused of plotting to bomb vital institutions in the country. ■ On 6 October 2010, the Lower Criminal Court sentenced one person to a month’s imprisonment for his involvement in riots. ■ On 10 October 2010, the Court of Appeal ordered the Public Prosecutor to summon an individual to Court on 6 February 2011 due to his involvement in a car bomb in the village of Daih. 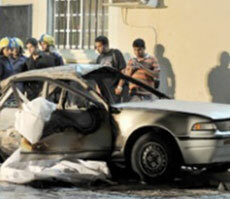 The car exploded in April 2009, killing one accused and causing the other to lose his sight. The latter was sentenced to ten years’ imprisonment. ■ On 15 October 2010, security forces arrested three women from Sitra. The women claimed being subjected to ‘mistreatment’ by the security forces while being searched at the entrance to the village. On 17 October 2010, an official from the Ministry of Interior Mohammed Rashid bo Hamood said that the three women insulted the security forces verbally and physically, and that the testimonies of the security forces were recorded. The men were also referred to a hospital for medical examination. ■ On 17 October 2010, the High Criminal Court sentenced two persons to five and three years’ imprisonment respectively for using Molotov cocktails to burn the lighting box of the Osama bin Zaid Mosque. ■ On 26 October 2010, the High Criminal Court sentenced six persons to five years’ imprisonment for using bombs to attack the house of former Municipal Member Ali Mansour,. While announcing his intention to drop the case, Mansour demanded the release of the detainees. ■ On 26 October 2010, the Lower Criminal Court sentenced a citizen to a year’s imprisonment for distributing publications that incite hatred and contempt against the regime. ■ On 1 November 2010, the Third High Criminal Court sentenced four youths to five years’ imprisonment, and a fifth one to three years’ imprisonment, for burning rubbish bins and placing them in the middle of the street in Ras Ruman. ■ Five citizens have been imprisoned for their involvement in the fire of Adhari Amusement Park, which took place on 14 March 2010. The five persons went to the park at night and set tyres on fire, which caused burns to three of them. The fourth individual then took them to hospital for medical treatment, and gave false information on how the injuries were sustained. The Court sentenced three of the defendants to seven years’ imprisonment, and the fourth to three years, whilst the fifth individual is serving a six-month sentence. ■ On 3 November 2010, Mohammed Mushaima, son of Hassan Mushaima, appeared before the Lower Criminal Court with another defendant in the presence of their lawyer. The trial was adjourned to 20 December 2010 in order for the defence to present their pleadings. ■ On the dawn of 5 November 2010, 40 cars were vandalised by anonymous individuals who pierced their tyres. Complex 303 was also vandalised. ■ On 6 November 2010, the High Criminal Court sentenced a citizen to three years’ imprisonment for causing the explosion of a gas cylinder in the governorate of Muharraq and for setting tyres on fire. The defendant had previously been convicted and sentenced between two to five years’ imprisonment in other security cases. ■ On 17 November 2010, the High Criminal Court sentenced four persons to periods ranging from three to five years. The four persons had attacked a police patrol car with fire bombs on 20/11/2009. 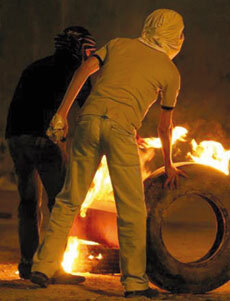 In a separate case the same Court acquitted a defendant of riot charges and tyre burning in the city of Muharraq.